Creating a brand new company store from scratch can be intimidating and time-consuming for a distributor. But you don’t have to be a designer to create a clean and professional Company Store. You can easily set up a gorgeous, modern store with little to no experience. And, keep in mind – we are always here to help you build that perfect store so can make sure you get the most out of your Company Store investment. Branding the store is going to be the biggest component of your store design. Creating the overall look and feel of the store is what will bring your store to life and generate the product sales. 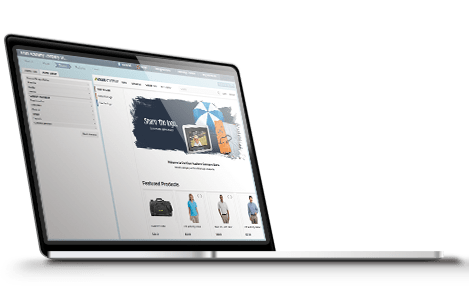 The tools our software offers, such as drag and drop page builders, mobile friendly templates, and custom theme design provides you with flexibility in how your store is set up. Your homepage is prime real estate for selling your products, make sure you use appealing content to guide shoppers through the store. If you don’t have the time to build the store yourself, it is probably worth it to take advantage of our turnkey solution. One of our talented designers can design a fully customized store for you. The next step to building a successful store is to think about your user’s experience. Think back to those 5 Questions you asked your clients before starting to build their store…what were the most important features they needed? Does your client need to control specific elements of the store? Are they running a particular employee program or points store? This is that ever important step where you need to set up users, determine if shoppers need to self-register upon entering the store or perhaps you’ll allow users to check out a guest. You’ll also need to be ready to set up any integrations that will help you and your client manage their business, such as shipping and sales tax. Our stores are very flexible and integration friendly, we’ve integrated with hundreds of other systems over the years. Once you’ve set up your user’s shopping experience, it’s time to start adding and organizing products! Featured Products: Display your most popular selling products directly on the homepage. Product Brands or Logos: Nike, Callaway, Eddie Bauer….you get the idea. Corporate Divisions: Perhaps your client has various divisions within their corporation – it might make sense to separate the store products based on those divisions. Once you have the categories designated, adding the products yourself is a breeze! You can add your own custom products or copy products from our supplier database. From here, you can customize the images and product descriptions, adjust the pricing as necessary, edit the various product options. Lastly, your clients look to you as a critical part of their creative team, show you’re enthusiastic about the store’s success by staying current on the latest promotional product trends. Take advantage of seasonal messaging to update your homepage. Refresh your images and maintain descriptions periodically to keep shoppers returning to your store for more.